What’s that? Yet another player in the battle-royale experience you say? That’s right. So, what sets Battlerite Royale apart from the other representatives of the genre? Let’s discuss. Ever since those “other two” games arrived on the scene, developers have been feverishly working to give us similar offerings featuring huge maps, lots of free-for-all PvP action, and everyone trying to loot equipment to get an edge on, and take out, the competition, all to be the last one standing. 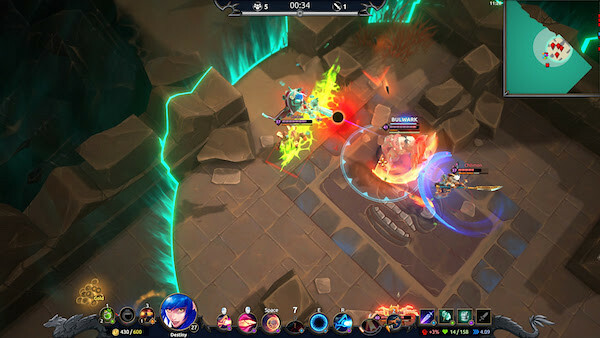 If you’re a fan of League of Legends then you’ll probably enjoy Battlerite Royale, if for no other reason than the characters and graphics are similar. There are two options for combat styles: melee and ranged. The ranged heroes shoot magic, bullets, or arrows. The melee are a bit more varied in their attacks but all are big, slower, and have status effects that can slow or stop their opponent. Loot is initially contained in treasure “orbs” of varying rarity. However, instead of acquiring just equipment, armor, and weapons you get access to your character’s skills and power-ups for those skills. All loot, except consumables, is upgradeable, from Normal to Epic through opening more and more orbs, air drops, and looting other corpses. Gold is also dropped by orbs and defeated foes, and can be used during the matches to purchase items or skills of random rarity from merchants throughout the map. As I mentioned before, the map and graphics are very reminiscent of “League”. From the characters to the map elements and top-down perspective, the inspiration is obvious. The map is interesting enough to keep you running around abandoned mines, ruins of castles and cathedrals, docks, or desert villages in a mad dash to power up your skills before your enemies, to get that little edge on the competition. So, how’s the gameplay? It’s good. There is an option to play through a basic tutorial, or you can choose to practice different characters in matches versus multiple AI opponents. There is a bit of strategy required to be the “Diner of Chicken” at the end, especially when playing the 2-person team matches versus other players. Loot orbs are somewhat randomized as to where they’ll appear, so hunting them down can be fun and tense. The action and graphics are pleasant and flow well. The sound is good quality and the combat is the usual “run-loot- FIGHT-loot-run-FIGHT” tempo. I will say, it’s pretty gratifying to hear someone getting into an orb on the other side of a wall and ambushing them! The map is smaller than you might think, so interaction cannot be avoided for long. One fun thing they added was, if you stand still in the brush you disappear. Of course, so do your opponents, so ambushing is definitely a thing. Battlerite Royale has in-game purchases for cosmetics, which can also be earned by random loot chests you win and earn from achievement awards. Extras include weapon and character cosmetics, poses, emotes, and mounts. They don’t give you any play boosts, so it’s purely for “prestige”. 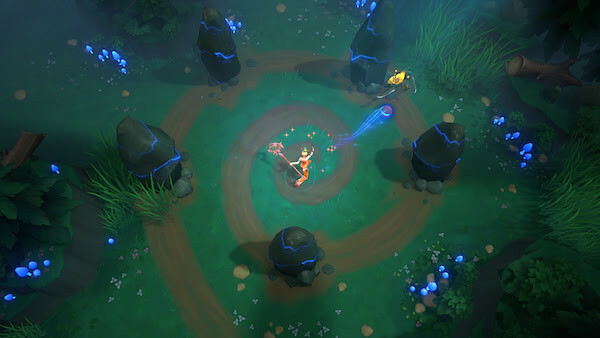 In the end, Battlerite Royale is yet another battle royale. With the exception of the fantasy theme and the from-the-top perspective, that’s what you get. The graphics are pleasant, the audio is good, and the gameplay is smooth. If you love the genre, definitely take a look. The similarities between Battlerite Royale and League are obvious. Don’t get me wrong, it’s a fun game for a while, but unless you’re a fan and into achievement hunting for the cosmetics, the novelty wears away pretty quickly. Why Aceshi? Dad and I used to play online poker together, and we just started saying it after a good bluff! I’m an old-school 45+ year-old gamer, everything from pong (yes, pong!) to the PS4 and PC new releases, with a deep and abiding passion for all things gaming. Explore the fantastical Talon Island in a thrilling fusion between a MOBA and Battle Royale game. Choose your Champion and master their unique abilities, loot for treasures alone or with a friend, and rise above the competition in a top-down action-fest. Only the best survive to the end!